Green Hill Guest House, Bukit Lawang, Sumatra. Beautiful hotel accommodation in treetop bungalows with stunning jungle and river views. Green Hill ECO guest house is situated in the quiet and peaceful up river area of Bukit Lawang. Once you walk up the natural stone steps you will be immersed in a haven created from ethically sourced and natural materials…built to be in harmony with the surrounding environment. Food is really important to us at Green Hill and we have a popular restaurant with a great all day breakfast selection yummy fresh fruit juices and smoothies, smoothy bowls, traditional Indonesian dishes and your favourite western comfort food. All food is freshly prepared to order from natural ingredients and is mostly plant based so no worries if you are vegetarian or vegan…lots of lovely tempeh and tofu dishes…mmm mmmmmmm. At Green Hill guest house our simple guest rooms are built from sustainable and ethically sourced natural materials (wood, river stones, bamboo) and are nestled among the treetops on the hillside behind our restaurant…they have all you need for a comfortable stay and a good nights sleep. We have only five rooms which enables us to know all our guests and give you a personal service. You only need to ask at reception if there is anything you need. 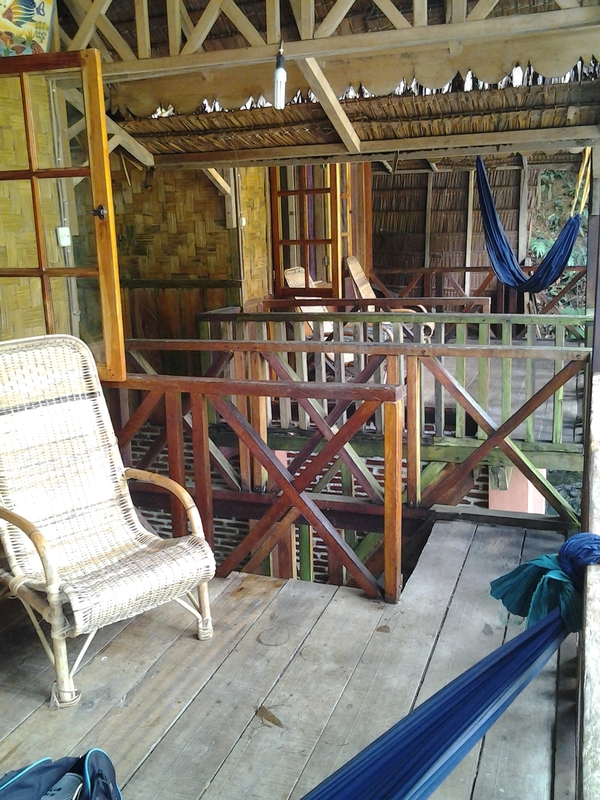 two double TREETOP BUNGALOWS: 200,000 IDR each per night. Good size double bed with mosquito net, private bathroom with bamboo shoot shower, lovely large balcony with hammock, chairs and amazing view of the national park rainforest and river. :200,000 IDR per night (two people) 250,000 IDR per night (3 people). Good size double bed and single bed with mosquito nets, open air private bathroom with bamboo shoot shower, balcony with amazing view of the national park rainforest and river. An extra large, split level room ideal for families, groups or couples wanting a bit more space. Our lovely chalet has a double bed plus mosquito net and a raised cabin bed with mosquito net. The bathroom is spacious with a bamboo shoot shower and the large balcony has a panoramic view of the national park rainforest and river. one BUDGET room: 100,000 IDR per night (1 or 2 people).can sleep 1,2,3 or 4! This room is great for backpackers or people on a budget and is great value. 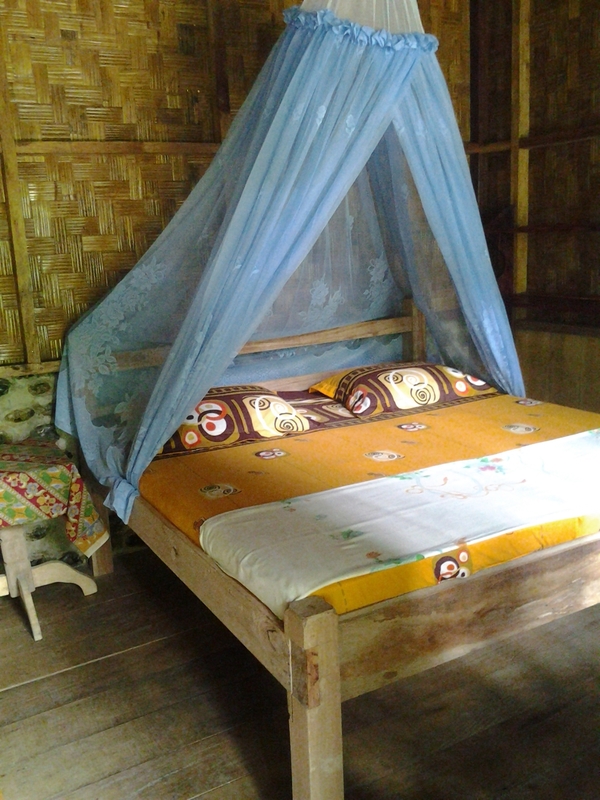 It has a double bed (extra mattress can be added @ 50,000 IDR per person), a great jungle view and a shared bathroom.